Mild climate. Always warmer & sunnier than UK! A very light, comfortable, spacious stone detached home. Well renovated and maintained in stunning location. A nature lovers' paradise with lots of space for domestic animals too. A heat exchange pump supplies the hot water and central heating (under floor on ground floor and individual radiators upstairs). Fibre Optic Wi-Fi. Septic tank. Entrance to large living area. Ceramic tiled floor throughout. Living room: 9.2 x 5.7 (52.4m2). Two south facing windows and large patio doors giving access to garden terrace. Currently divided into dining and sitting areas by book shelves. Landing 2.5 x 3 (7,5m2), used as office. Long window onto garden. Long window at back overlooking garden and Marais. Front, south facing window overlooks fields. Bedroom 3: 3.25 x 4.85 (15.76m2). South facing window. Internal door leads into bathroom. The house has an attached two storey stone building 6 X 6: (total 72 m2) which will easily convert to a very pleasant two-bedroomed home. The house has occasionally been let as a holiday home and the mobile home used as owner’s temporary accommodation. Behind this is the Swimming Pool area. Pool, 11 X 4.5, pool shed with filtration equipment (pump renewed 2018) and grass and paved areas with wonderful views. Two Fields, currently home to 3 donkeys, 4 Ouessant sheep and a small goat. Animal shelters and former hen house. There are apple, pear, plum, cherry, peach, fig and walnut trees. Each area is well-fenced and the whole property is thus secure for children and animals. 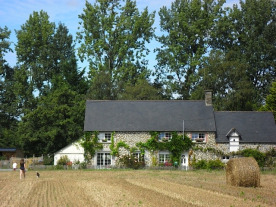 The back of the property is bounded by a stream (fishing) which can be crossed to walk on the Marais, populated by a variety of birdlife and, in summer, cows. Owners of properties backing onto the stream have an ancient right to graze animals there. In the winter, this Marais floods naturally and may resemble a lake. There is much wildlife to be seen from the house and garden. The property is on the Brittany/Normandy border in the Mont St Michel Bay. Tranquil, but not isolated. Beautiful countryside and close to beaches. Local town and excellent supermarket under 2 kms. Markets with fresh produce. Many marked footpaths, beautiful villages and towns, restaurants, tourist attractions, etc. Pleine-Fougères (2kms) has schools up to lycée level, medical centre, pharmacy, banks, post office, bakers, hairdressers, butchers, notaire. Dol has good restaurants, cinema, mediatheque, swimming pool, 2 lycées, great Saturday market. Rennes and St Malo are larger towns close by. Mainline station at Dol de Bretagne with TGV to Paris. Airports at Rennes and Dinard. Ferry ports at St Malo, Cherbourg, Caen, Le Havre, Dieppe. Easy access to N176 across Brittany. I'd be very pleased to have telephone discussions and take more photos to order. This is a wonderful home and I'm very reluctantly leaving it after 15 happy years.